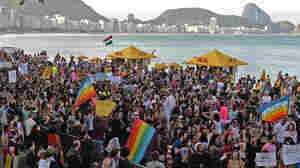 November 27, 2013  In a spate of robberies in Rio de Janeiro, young boys — some only 10 years old — descend on tourist beach areas, robbing and harassing people. The attacks come despite anti-crime efforts in the run-up to the World Cup and Olympics. It's a phenomenon that had not been widely seen since the country's crime-ridden 1990s. 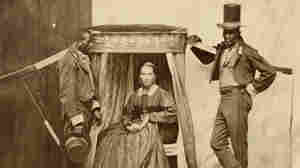 November 12, 2013  The South American country was the last place in the Americas to abolish slavery and that period coincided with a boom in the then new medium of photography. what resulted is arguably the largest archive of photographs of slavery in the world, and that is giving new insight to academics and ordinary Brazilians on the country's brutal past. November 6, 2013  The major soccer convention that was to be staged in Rio de Janeiro on the eve of the World Cup draw has been cancelled. Due to happen next week, organizers said it won't go ahead because of ongoing civil unrest. Brazil's government says it has to do with funding. Christmas Will Come Early To Venezuela, But Is It Just A Ploy? November 5, 2013  Venezuela's President Nicolas Maduro announced an early start to the Christmas season because he wants "happiness for everyone." The decision means that workers will receive the first two-thirds of their Christmas bonuses and pensions this month. Critics say he's just looking for votes ahead of municipal elections in December. October 31, 2013  Once among the richest men on the planet, Eike Batista's wealth has evaporated. From a net worth of $34.5 billion last year, the Brazilian businessman is now worth less than 1 percent of that. Many observers see Batista's fall as a parable for the nation's economic woes. October 28, 2013  Latin America has some of the most restrictive anti-abortion laws in the world. Many countries in the region have a total ban. In Brazil, abortion is illegal, but there are some exceptions. A new bill is trying to roll those exceptions back. Brazil's Black Bloc Activists: Criminals Or People Power? October 22, 2013  The protests that swept through Brazil last summer raised the profile of the Black Bloc — masked anarchists who use violence to get their anti-capitalist message across. The secretive members explain that their tactics are intended to shake up a corrupt and complacent government. But many regular protesters feel that the Black Bloc has hijacked their movement and that they do more harm than good. October 2, 2013  Cuba has been sending doctors abroad for decades to work throughout Latin America and as far away as Africa. So it's not surprising Brazil turned to Cuba when it wanted to import thousands of badly needed doctors. But Brazil's medical establishment objects and wants to block the program. Holy Smokes, Batman, You're Protesting In Brazil! 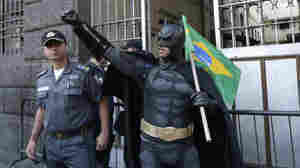 September 29, 2013  Protesters are dressing up as superheroes to demonstrate in Rio de Janeiro, but that's not the only place caped crusaders have taken to Latin American streets. September 25, 2013  Brazil is formulating a bold new plan to protect itself from NSA spying after revelations that the U.S. illegally listened in on conversations between the president and her cabinet, and spied on the state oil company, Petrobras. But experts warn its easier said than done and there are risks inherent with tampering with the internet. September 24, 2013  Sao Paulo, Brazil, is the last place where the iconic vehicle is manufactured. Production is scheduled to stop at the end of the year. In Brazil, many the vans are turned into food trucks or school buses. September 20, 2013  Not only are Brazilian artists now getting big play in major museums around the world, but something new is happening inside Brazil: There's a burgeoning appetite for art. September 18, 2013  Brazil's favelas, or slums, are notoriously violent places, and in recent years, the Brazilian government has attempted to establish order through police-run "pacification" programs. A cable car ride above several favelas gives a clearer view of what's happened in the communities in recent years. September 18, 2013  Brazil's President Dilma Rousseff has put off her state visit to the United States over allegations that the National Security Agency spied on her, ordinary Brazilians and the state oil company. This was supposed to be the first state visit by a Brazilian leader in two decades. September 17, 2013  In a slap to the United States, Brazilian President Dilma Rousseff announced she is postponing her state visit to Washington. It was scheduled for Oct. 23 and would have been the first state visit of President Obama's second term. 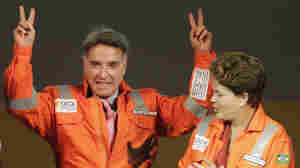 The postponement follows revelations that the National Security Agency spied on Rousseff, her top aides and Brazil's state-run oil company.